Now, the Bank of Seat Pleasant gets 20 goats/mo. from Alfie, but it can only gainfully pasture and lend 10 goats per month itself. So it has a standing agreement with the Nutbury National Bank in Connecticut, whereby BOSP loans the other 10 goats to NNB at 5% per annum (i.e. one goat biennially), shipping them in armored livestock vans on some pre-arranged schedule. Turning our attention to my Connecticut-based friend Hay, who is extremely fond of hydrangeas but otherwise reasonably sane, we find him at the Nutbury Hydrangea Nursery. He only has 5 chickens (standard exchange rate = 8.5 chickens to the goat, see fine print op. cit.) in his portable wallet-coop, but he brought his On The Hoof™ debit card (fee-free thoughout the entire Goat Remote® system) along as well. And it’s a good thing, too, because they’ve just gotten in the hot new hybrid wonder-hydrangea H. x. ‘Stay-Puft Cumulus’. The nursery is charging a pricey 2-1/2 chickens apiece; but Hay, having learned of their existence and availability, will now not be able to survive until midnight without at least one. He throws fiduciary prudence to the wind and buys three of them, and with state and local sales taxes (we won’t go there) he authorizes a debit totalling (ever-so-conveniently for us) exactly 8.5 chickens (and is glad he still has some chickens on him in cash when he stops by KFC on his way home). After a trusted nursery employee totals out the day’s charges and credits and takes them to Nutbury National Bank the next morning, he returns with one goat in payment for Hay’s purchase. Alfies recieves Delores; along with several other goats, a few chickens, and some chicken feed; in her pay packet. 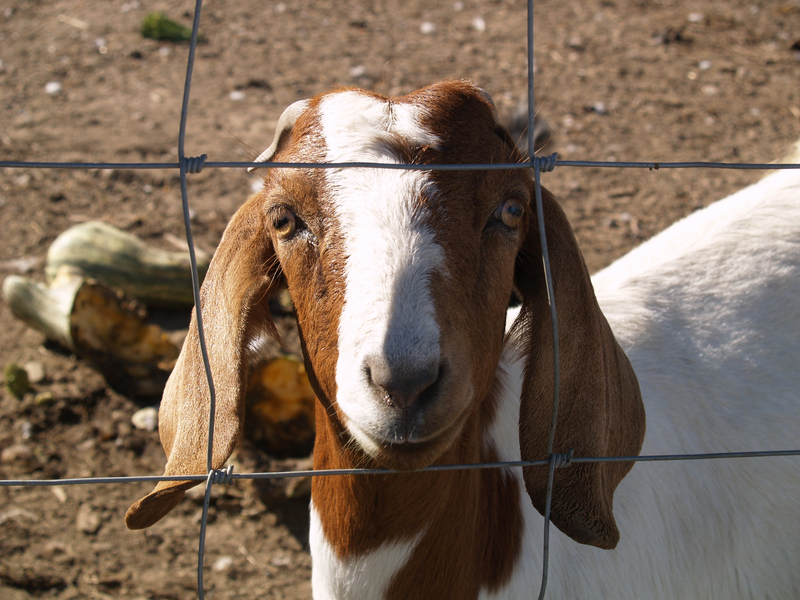 Delores is then bundled up with 19 other goats and sent to the Bank of Seat Pleasant to pay Alfie’s mortgage. After a brief stay at BOSP, D. is trucked up to Nutbury National Bank, where she joins, among others, a few goats that were in Hay’s pay packet and which he deposited in his checking account at NNB. Thus, some monetary value from Alfie’s paycheck has covered the purchase of Hay’s hydrangeas. Now, Alfie has pointed out to me that while you can eat goats and chickens; should the worst come to the worst, and assuming that you’re not a vegetarian; they’re not very convenient for carrying discreetly about one’s person. Which is why her grandmother’s family kept all their money in the form of jewels, which are much more portable and less obvious than goats or chickens, and don’t take nearly the same sort of daily upkeep. But you can’t eat jewels, either. Like small green pieces of paper, or little round disks of shiny metal, or certain sequences of 1’s & 0’s, they only have value because we all agree that they have value. If diamonds were to flood the market; as they did in the late nineteenth century after the huge diamond finds in Southern Africa; the value of diamonds would drop like, well, a rock. It goes similarly for goes for the dollar or any other currency: it has value because we all say it does, and we all (more-or-less) agree on what that value is. If no one believes that the Elbonian MudDucat is worth any more than any other small mud-colored piece of paper, the Elbonian currency collapses. And if it turns out that Nutbury National Bank had a big goat-roast at their annual company picnic yesterday, and now there are nowhere near enough goats in NNB’s pen to cover all the promissary goat-notes they have out in circulation, there is a strong risk of a sharp decline in the value of the Nutbuck. “Please send all your worthless dollar bills to the Nutbury National Bank in Connnecticut for furthur deposit into the account of Nutbury Hydrangea Nursery and make a note to credit it to the account of Hay. Please feel free to throw in the family jewels (the glittering kinds), and, you’ve got any old pretty stock certificates around, you can send them along, too. Thanks. I hate to see you burdened. If Evelyn would just go one step farther, I think we’d be right on the money, as they say. (Alright, Hay, maybe I would view all this differently if I owned any stock certificates, or a house; or if the coupons I clipped out of the paper last week weren’t already expired and worthless. Of course money is real and has value. It’s real just as long as enough of us believe it’s real, and it has value as long enough of us say it does. And since money is so handy for helping us exchange goats, chickens, hydrangeas, real estate, & etc. ; and keep track of all those exchanges; let’s hope that Ben Bernanke can get consistently better results than Tinkerbelle does. This entry was posted on September 23, 2008 at 10:29 am and is filed under Odd Explanations. You can follow any responses to this entry through the RSS 2.0 feed. You can leave a response, or trackback from your own site.